Includes OSHA 16 Hour Confined Space Entry with an emphasis on turbine blades for inspection and repair crews. 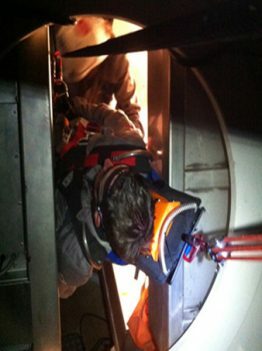 The OSHA 16 Hour Confined Space Entry portion provides Confined Space Entry training to any personnel required to enter confined spaces per 29 CFR 1910.146. and the techniques utilized to extract an individual from those locations safely. All Tech Safety Lines’ rescue and safety training programs meet or exceed ANSI and OSHA standards. Please contact us for pricing and further information. If you’d like to learn more about our training. visit the About Our Training page.